This is the perfect afternoon snack…it almost tastes like a meal, even a little bit like dessert. Brown rice is a natural whole grain with a mild nutty flavor that I love! Because brown rice still has the bran intact, it has 3x the amount of fiber than white rice. Brown rice is also full of nutrients like magnesium, manganese and zinc. These nutrients are in much higher concentrations than what’s found in white rice. 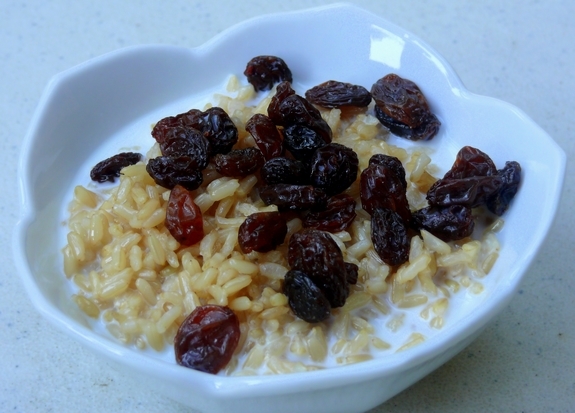 Raisins contain a good deal of protein, dietary fiber and are high in certain antioxidants. I read something recently that said even though raisins have a high concentration of sugar, they fight bacteria known for causing cavities and gum disease. Who knew? Anyway, give this one a try with your leftover brown rice from dinner. It’s a winner. Place all ingredients in a small bowl and warm up in the microwave. I love brown rice too and I bet this does taste like dessert. Perfect for the middle of the afternoon blahs! That looks very tasty! I’d use vanilla almond milk instead but can’t wait to try this one!